The last post on Goa's northern border, Terekhol Fort sits on the headland looking out over the Tiracol river and the magnificent sweep of sand below that is Keri beach. It is easily one of the most captivating views in Goa, and is well worth the enjoyable trip across the river and up the steep, shady hillside. Terekhol Fort (also spelled Tiracol or Terekol) was built at the beginning of the 18th Century by the Marathas (native Marathi speaking people). It was quickly taken by the Portuguese, who held on to it until Goa achieved independence from its colonial rulers in the 1960s. Inside the fort, the small St. Anthony's Church founded in 1746 has been a parish church of Arambol since 1934. The church is often locked, though guided tours are possible. The courtyard and outdoor terrace are open to the public, though the building is now a luxury hotel, and viewing the interior is reserved for guests or anyone who manages to obtain permission from the hotel manager. The fort was the site of a few small rebellions against the Portuguese, the latest of which was in 1954, when two Goans were shot for hoisting the Indian tricolour flag from the ramparts. Visitors are welcome to explore the small courtyard that surrounds the chapel, and climb up to the hotel's terrace, where excellent but expensive food is served al fresco. If you feel that this will dent too large a hole in your wallet, you are welcome to enjoy a few drinks or just appreciate the stunning views. Staying at nearby Keri beach, or Arambol beach further down the coast means that you can take an easy daytrip to the fort. 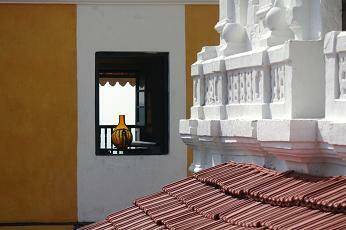 For a luxury stay, the Tiracol Heritage Hotel offers accommodation in the fort over 5 rooms and 2 deluxe suites. Prices vary a little depending on the time of year, but expect to pay the same as you might for a high quality hotel in your home country. Tel: +91 (0) 832 2276793, e-mail: nilayahermitage@sify.com or find a contact form on the Nilaya Hermitage website: www.nilaya.com. 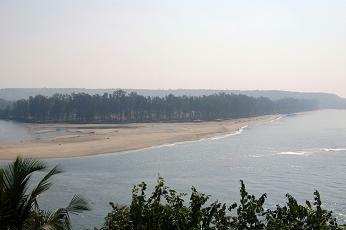 Terekhol is accessible from the rest of Goa only by crossing the Tiracol river, which can be done on the free car ferry at Keri beach jetty. At low-tide the crossing is suspended for a few hours, though if you are desperate to cross, another ferry crosses 4km upriver. 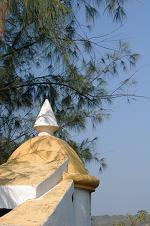 Once across the river from Keri beach, it is a short walk / ride up the hill to Terekhol Fort. The Keri beach boat jetty can be reached by the daily Kadamba bus from Panjim, or by public bus from the bus stop in Siolim (leaving 7a.m.). If you have hired a bike or scooter, go past the petrol pump at Arambol (stopping, perhaps, to fill up) and continue towards the Tiracol river that hugs Goa's northern border. Here, the road veers left and takes you through scenic Goan countryside as you descend to sea level. The jetty is on the main road, just after the turning to the south end of Keri beach.